Biochar, a charcoal-like substance created by pyrolysis (high-temperature, low-oxygen burning) of green waste, has potential to protect trees against stress, according to trials by Bartlett Tree Research Laboratory, part of Reading University. These found that young horse chestnut trees replanted in poor clay soil showed higher leaf chlorophyll content and improved photosynthetic efficiency of up to 12.5 per cent over two growing seasons, with superior results from a more granular biochar compared a powdered form. Further research recorded similar increases in chlorophyll leaf content of bare-rooted European beech transplants through addition of bamboo biochar or mixed woodchip biochar compared to controls. Marked improvements in transplant survival, of 24-50 per cent, were also in soils amended with biochar. Current research is also demostrating how Carbon Gold’s biochar-based Tree Growth Enhancer can boost saplings’ ability to withstand drought, with 90 per cent of cherry saplings retaining their leaves after three weeks of drought, compared to none of the control saplings. Similar results have been achieved with the more xerophytic (drought-adapted) species western hemlock (Tsuga heterophylla), and among drought-stressed alders. Bartlett research technician Emma Schaffert said: “With extremes in climate becoming more frequent and unpredictable, this product could potentially reduce the effects of these events, particularly drought. Research is also looking the effect of source material for the biochar on plants’ response, she added, with Bartlett and Carbon Gold planning to investigate the effect of biochar different hardwood and softwood species on soil and plant health. 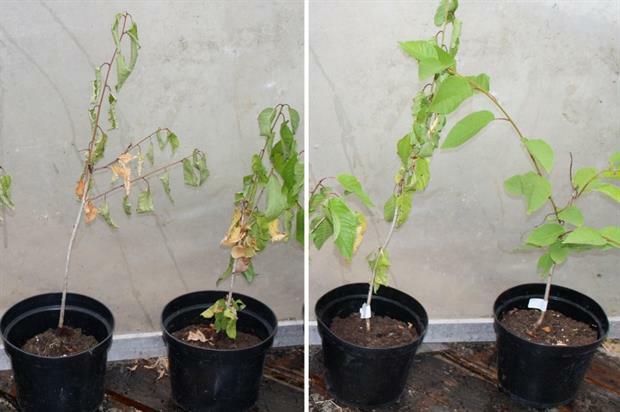 Previous trials carried out by Bartlett scientists in the US have demonstrated biochar’s plant protection properties, suggesting it could boost resistance to the many pest and disease problems now afflicting UK trees.